This episode features director Brian Smith and actor Albert Young from the Off-Monroe Players' latest production, "Sweethearts," credited solely to William Gilbert of the famed Gilbert and Sullivan; features music by Chilliwack, Gentle Giant, The Andrews Sisters, Crosby, Stills, Nash and Young, Restless Heart, Billy Joel, Don Henley, Journey and Mandy Patinkin & Bernadette Peters. This episode - back in the WAYO studio after a snowbound episode from the Retreat - features actors John Jaeger and Olivia Knowlden from Out of Pocket's latest production "Yankee Tavern"; the host also talks about his visit to local legend Bat McGrath's final show in Rochester; features music by the Pretenders, John Mellencamp, The Rolling Stones, Traffic, Bruce Cockburn, the Grateful Dead, Warren Zevon, Corey Hart and Bat McGrath. This episode has the host staying away from the roads during another cold and wintry storm, but not before talking to director Lindsay Warren Baker and actors Colin Pazik, Kit Prelewitz & Emily Putnam on Blackfriars Theatre's production of "Ordinary Days"; features music by Susanna Rose, The Clash, The Psychedelic Furs, Hunter Foster, Sara Bareilles, Brandi Carlile, Joni Mitchell and Mr. Mister. This episode features friend and musician Mike Muscarella, discussing his work on the music/storytelling show "Parents and Children, Husbands and Wives: It's All Relatives" with wife Melanie and storyteller Penny Sterling; features music by U2, Violet Mary, Eric Clapton, the Partland Brothers, Jason Isbell and the 400 Unit, and Warren Zevon. This episode - the first of 2019 - features a conversation with actor Barbara Martorana and director Eric Vaughn Johnson from the OFC Creations musical "Produce"; includes music by Bruce Springsteen, Eddie Money, Tom Waits, Sylvie Lynn, Brandi Carlile, Clannad with Bruce Hornsby, Mike and the Mechanics, Squeeze, Nick Drake and Bat McGrath. 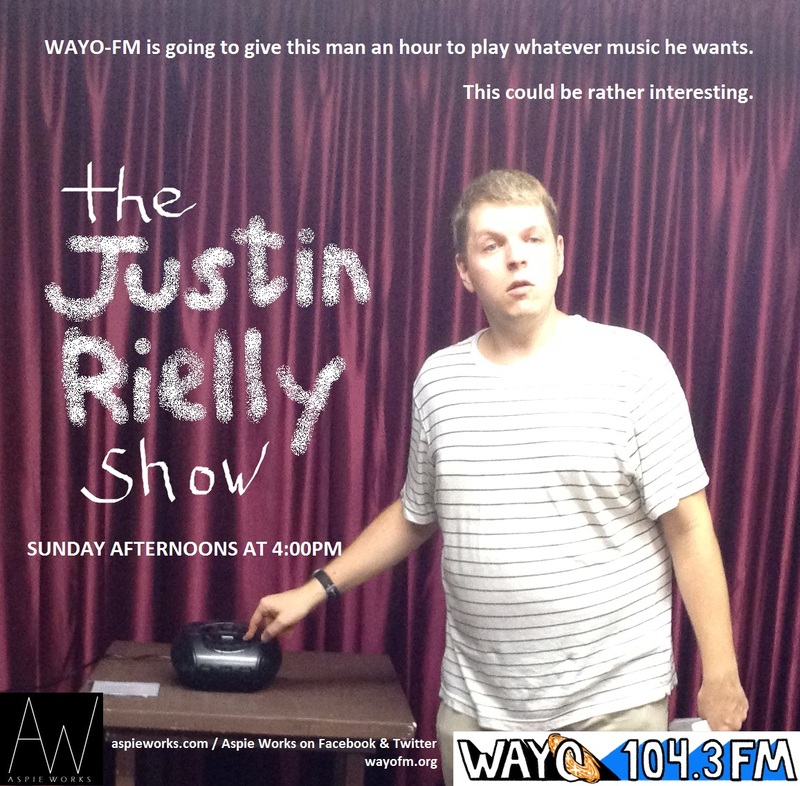 This last show of 2018 features director and WAYO host Philip Frey (who has appeared on the show more times than anyone), and features some '80s hits and lost classics; includes music by Wang Chung, Toto, Times Two, Double, Madness and Golden Earring. This last show of 2018 features director and WAYO host Philip Frey (who has now appeared on the show more times than anyone) and includes '80s hits and lost classics; includes music by David Bowie, Patrick Simmons, Al Jarreau, Breathe, Gino Vannelli, Roxy Music and Rush. This final episode of 2018 features long-time friends and favorite guests Marcy and Mario Savastano, as they prepare for DVC's concert fundraiser "We Are A(live)"; includes music by Joe Strummer and the Mescaleros, Sara Bareilles, Florence + the Machine, Nellie McKay, Bruce Springsteen and The Beatles. This is an encore presentation of the October 21 episode - actor-pastor Nicole Iaquinto and Kirt & Cindy Schutt discuss their trip to Mexico to explore the issue of immigration on that side of the border; features a new introduction and conclusion by the host. This Christmas episode features long-time fan and close friend Laura Bastida, as she and the host have a thoughtful conversation about the holiday, in terms of traditions and what it means to us when we get older; features holiday tunes from John Lennon, Bryan Adams, U2, The Waitresses, The Pogues with Kirsty MacColl, Bill Nighy (as Billy Mack), Mavis Staples, Dan Fogelberg and Greg Lake.